Portrait of a beaver swimming at Mass Fish & Wildlife’s Westboro Management Area. Not seen is its trademark tail, which is flat and paddle-shaped. Shortly after this photo was taken, the beaver dove and smacked the water with its tail, loudly warning other beavers of possible danger. A clear “third eyelid” protects the beaver’s eyes so it can see underwater, and special membranes keep water out of its ears, nose, and throat. Its back feet are webbed for swimming, and oil from a special gland waterproofs its thick fur. Every fall, from September through November, our local beavers get busy, or busier than usual, as they prepare to survive the winter, as so many animals must do at this time of year. For beavers, it’s the busy season for cutting down trees. What beavers? you might ask. Beavers (Castor canadensis) are native to North America, but they aren’t an ordinary sight in Westborough, partly because they’re active mostly at night and partly because they live mainly in water. But you’re more likely to see them today than in decades past. Our area has more beavers now than in the past 250 years. If you don’t see beavers themselves, you might notice signs of their work near water. For example, you might see a tree with its trunk almost gnawed through. Or, more likely, you’ll see stumps with pointed ends remaining after beavers have gnawed down trees and saplings. You might also spot a beaver trail leading to the water’s edge, where beavers have dragged branches and saplings into the water. What’s the point of all this tree-cutting? It’s food. Beavers are vegetarians, and large ones at that, weighing 25-75 pounds. They don’t hibernate. As winter approaches, there’s not much living vegetation to eat. They consume underwater roots of water-lilies and other pond plants, but they need more than that for the winter. Fortunately for them, beavers also eat tender young bark and inner bark, thanks to certain bacteria in their digestive tract that help them digest it. In the fall they stockpile branches and saplings underwater, near their lodge, for winter food. How do they manage to cut down whole trees? They have chisels – their very large upper and lower front teeth (which are orange-brown rather than white, despite what we might see in cartoons.) The big teeth aren’t surprising, since beavers are rodents – North America’s largest rodents, in fact. All their chewing keeps their front teeth sharp, and the teeth don’t wear down because they never stop growing. Food isn’t the only point of their tree-cutting. Building materials are also the point. You might spot a pile of sticks and mud at the edge of a pond and then realize that it’s not just a heap of woodland debris, but rather a beaver lodge. Still standing, but not for long. 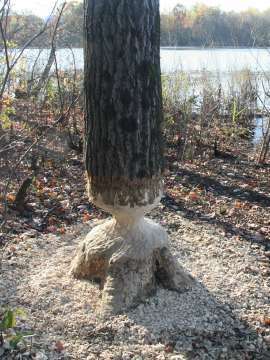 Beavers had gnawed almost all the way through this tree trunk when this photo was taken near Lake Hoccomocco. Beavers’ favorite trees include aspen, birch, willow, alder, and sometimes red maple. A family of beavers spends the winter in its lodge. When the ponds ice over, the lodge freezes solid and protects them from predators and freezing temperatures. Inside this fortress, the beavers have living space above the water, with areas for feeding and for resting. You won’t see an entrance because the entrances are underwater. The beavers come and go, swimming under the ice to their stash of refrigerated winter food and bringing back branches and twigs. A family of beavers, perhaps 6-8 or even a dozen animals, can eat a ton of bark in the winter. A typical beaver family consists of two parents, who pair for life (or until one dies), and their offspring from the past two years. Each spring, when 2-5 new young are born, the two-year-olds leave or get chased out. They go off to find their own territories and mates, usually within about 6 miles. Beavers are famous for remodeling the landscape to create themselves a place to live – a pond. They’re said to rival humans in their habit of altering the environment to suit themselves. Not surprisingly, beavers and humans often come into conflict as both work to transform the landscape for their own purposes. Beavers’ urge to build dams of sticks and mud is instinctive, in other words, programmed by their genes. A trickle of water sets them to work, not only building but also constantly repairing their dams. The whole family works at it. As water backs up behind a beaver dam, and the beavers build the dam higher, a pond forms, flooding the surroundings and creating a wetland. It becomes home not only for beavers but also for wetland plants and many other creatures – frogs, salamanders, fish, turtles, snakes, dragonflies, ducks, songbirds, and kingfishers. Trees killed by flooding are food and shelter for many insects and nesting sites for ospreys, great blue herons, wood ducks, and more. Does this landscape seem familiar? You might try envisioning Westborough’s Mill Pond, where until recently great blue herons nested in standing dead trees. Of course, Mill Pond is a flood control reservoir made by humans (in 1968-70) to control flooding on the Assabet River. But like a beaver pond, this large, shallow reservoir catches and stores water, releasing it slowly in a way that prevents flooding farther downstream. Eventually, beavers exhaust the supply of suitable trees close to water. They move out, and over time, the pond fills in and becomes a wet meadow, and eventually reverts to forest with trees that again attract beavers. Before Europeans arrived in New England, this cycle had been repeating and creating wetlands in forests here for thousands of years. 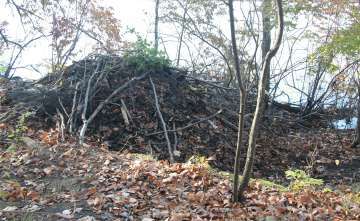 This pile of sticks, leaves, and mud is actually a beaver lodge at the edge of a pond in Westborough. The beavers enter and exit through underwater entrances. Air filters in at the top, through a small area not packed with mud. Ecologists regard beavers as a special “keystone species” because their dam-building creates a new environment for so many other creatures, increasing the biodiversity of an area. Troublesome as beavers and their damming can be for their human neighbors today, they were valuable to Native Americans, who coexisted with them and used their fur, meat, and the bountiful wetlands they created. Beaver pelts became the basis for early trade between Native Americans and Europeans. In colonial times, a profitable trapping & export industry supplied beaver furs for coats and fashionable hats in Europe. November’s full moon is traditionally known as the Beaver Moon, a name handed down from Native Americans and early settlers. But by 1750, even before the American Revolution, beavers had disappeared from Massachusetts. A combination of too much trapping and extensive clearing of trees from the land for farming caused their disappearance. 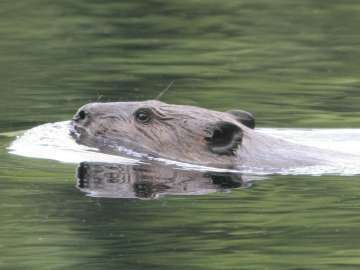 Why are beavers back? Starting in the early 1900s, they returned with the forests. Trees re-grew as Massachusetts farmers switched to factory work or moved to the Midwest to farm there. In the 1950s, Massachusetts set up a trapping season, and laws currently restrict the types of traps that are permitted. In the past ten years, beavers have been active in Westborough at Mill Pond, Lake Hoccomocco, and Cedar Swamp. They’ve probably been removed from many of these areas. Recently they’ve been busy in the Mass Fish & Wildlife Management Area off Rte 135 near the Northborough line. If you go there, visit on a Sunday, when there’s no hunting.